“Miscellaneous metals” are fabricated metal components made at our shop. 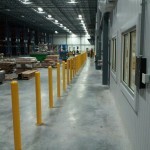 We install the components for our customers in a warehouse environment. 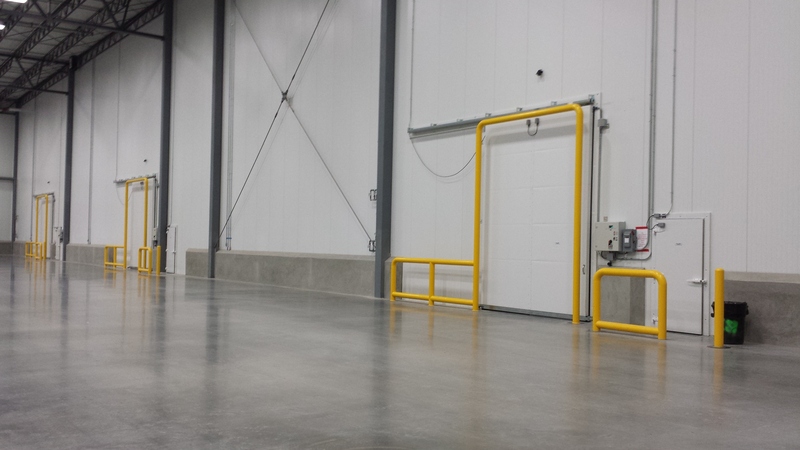 The components protect areas critical to the day to day operation of the warehouse from many types of equipment; forklifts, semi trucks, or any vehicles found on warehouse property. 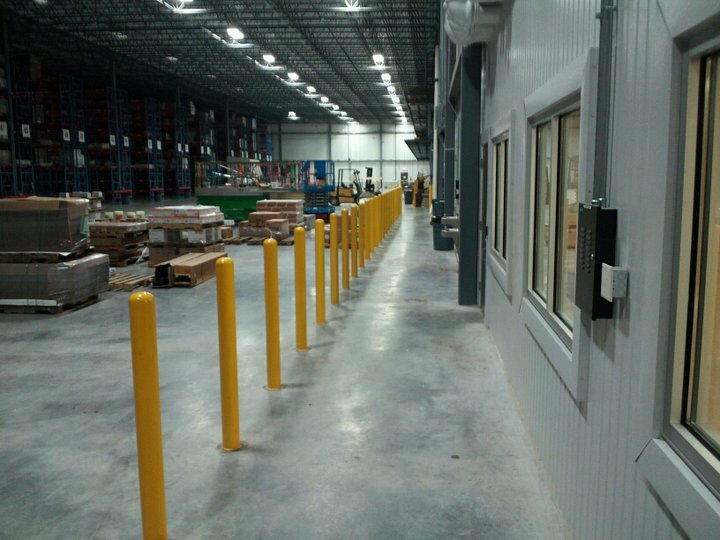 We fabricate and install miscellaneous metal components for warehouses of all sizes, and can fabricate them out of many different types of steel. Some types of miscellaneous metal components include items such as bollards, goal posts, guard rails, and ladders of all types. 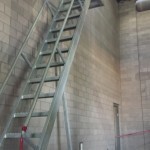 On a larger scale, we fabricate stairs of all heights and sizes, and out of a large variety of materials. 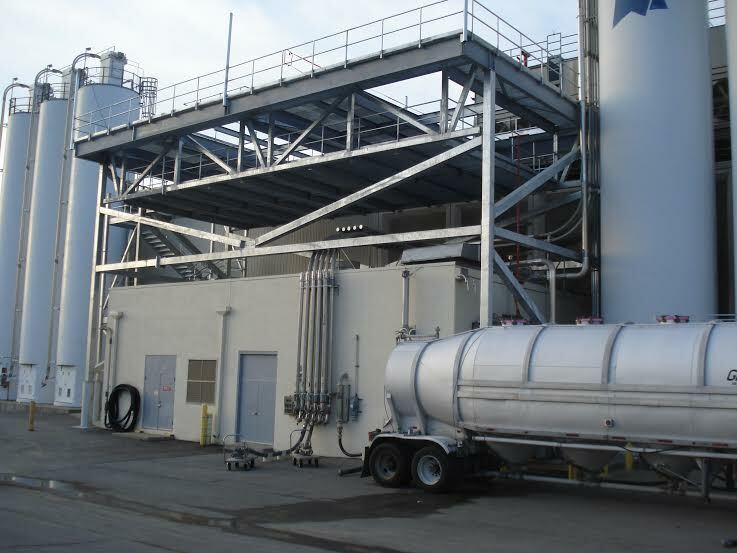 We have built mezzanines and equipment platforms, which are not as common, but serve many needs in a warehouse or food processing setting. Bollards are available in sizes ranging from 3″ – 12″ using steel, which can be processed with a galvanized or painted finish. The bollards can also be fabricated from stainless steel material in sizes range from 3″ – 6″. Bollards are also often referred to as guard posts. Typically, a goal post is fabricated out of 6″pipe ( usually schedule 40, but we have used schedule 80 pipe). 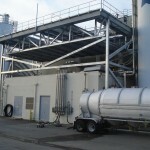 The finished product can be galvanized, painted, or stainless steel pipe . 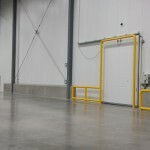 Goal Posts are a guard post for the perimeter of door openings in warehouses used to protect door tracks and openers. We build these out of 4″ schedule 40 pipe most of the time, but will custom fabricate the rails to your preference. 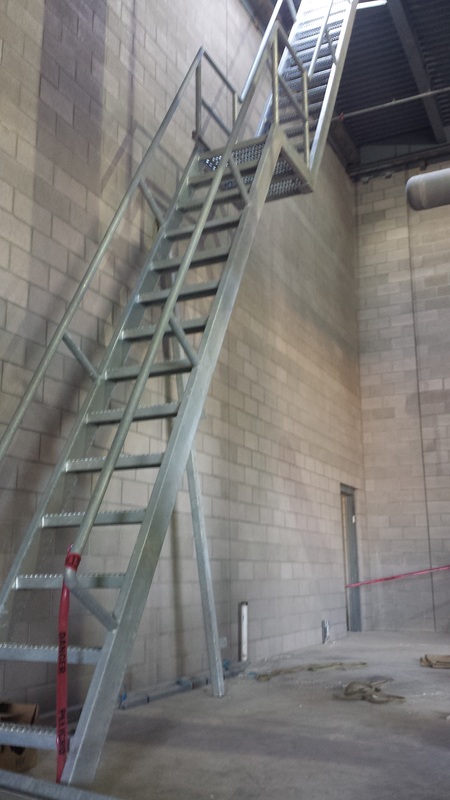 We build ship ladders, straight up ladders & caged ladders. The options for materials for these are varied, with most being made from steel. We have experience in using stainless steel and aluminum, which also make for very useful and nice looking piece of equipment when completed. 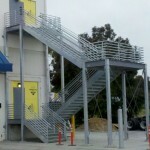 We have built stairs out of all types of material. Steel, stainless steel & aluminum. 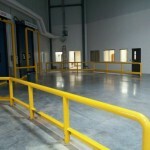 We use formed sheet metal to make pans for concrete treads, formed floor plate treads, grip strut treads & bargrate treads. 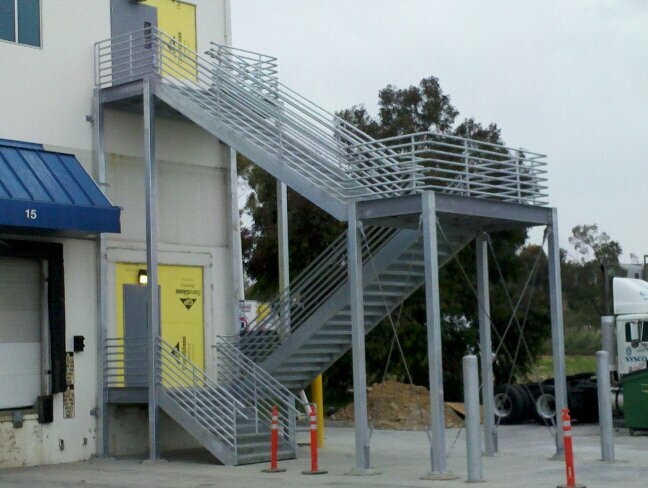 We have built many sets of dock stairs and towers to a height of 40 feet! We make these to our customers specifications, including desired material and specific type of stairs needed. 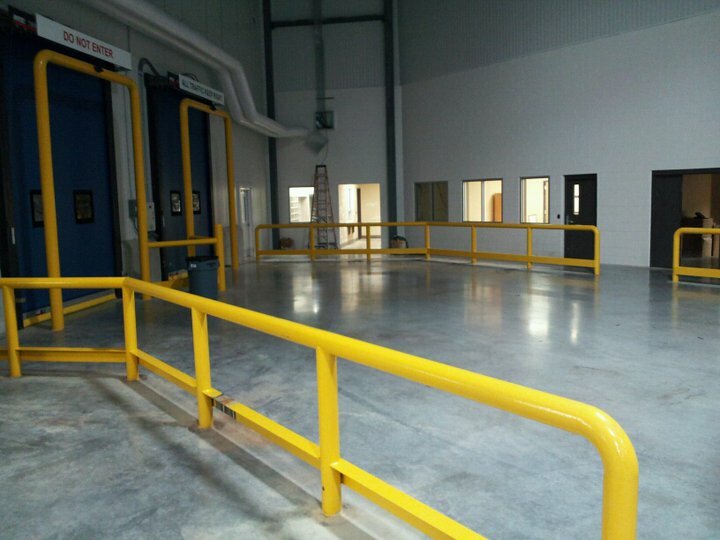 We have fabricated and installed elevated platforms with railings, access ladder or stairs for electrical equipment, computer equipment, office space, storage space, & refrigeration equipment. They range in size from 10′ x 20′ to 45′ x 65′ and from 10′ to 45′ in height. The largest of which was for refrigeration equipment in Tulsa OK, for BAMA Foods, weighing in at 100K to support four new refrigeration units.